Using Xanga over Blogger is a lot like using Myspace over Facebook. It makes things really easy, at the cost of all moral values and good graphic design. I desire greatly to return to the world of Blogger, but I don't want to do so without building up readers and linking to really good blogs, like John Toto's, like Mike's (best art design ever), etc. 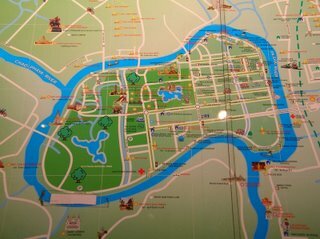 This is the city of Ayuthaya, in Central Thailand. I will be living and working in this town for just over a month this summer. I have waited so long for this to finally happen, my chance to dive deeper into the world of international cross-cultural work than I ever have before. This is my chance to begin testing what I have learned, and learn new things that will test me. It's a chance to taste, and touch, and smell, and see. As much as possible, I will post here during my time abroad, and tell of what God is doing among the Central Thai people group, but as for now, God is working in my life by allowing me to have the first decent night's sleep in sometime, after I do a few pages of reading. So please pray for the Central Thai, follow this think to my Xanga and lift up the short-term mission team that is there now (including my family). awww...thanks pablo...and know I'll be praying for you as you prepare and go to SE Asia...regardless of the compliments...but flattery does help!